Biologist Alexander Semenov and his team are planning to sail 35,000 nautical miles around the world in three years, executing hundreds of dives to study the life of oceanic creatures and telling the world about their discoveries. The Aquatilis is the first Russian round-the-world expedition dedicated to studying the life of the oceans. Alexander Semenov, the project’s organizer and its source of inspiration, is head of the diving service of the White Sea Biological Station of Lomonosov Moscow State University; he is also a renowned underwater photographer. Semenov has been writing a popular science blog on marine research for seven years. His main goal is to show people what an amazing world is out there and what unusual and beautiful creatures populate it. Thus, the proposed expedition will be dedicated not only to studying oceanic creatures, but also (and primarily) to popularizing science. “The ocean is like a parallel universe: It’s another world populated by totally amazing creatures. We believe people need to be shown how interesting and impressive scientific research can be. We are dreaming of a new Odyssey by continuing the beautiful and noble cause of pioneers of underwater studies,” Semenov says. The team on board the Aquatilis will be webcasting to blogs and social networks, telling the world about the creatures they meet and about marine research, posting photos and videos, and interacting with their audience. The expedition is expected to create a unique bank of photo and video material about the world’s oceans, including thousands of high-quality, color pictures of rare and potentially never-before-studied organisms. “As a naturalist, I observe the entire underwater world that is accessible to a camera lens. This is a very interesting line of work; we’ve been diving here for years. This is my seventh or eighth year, and I dive all the time, observing the same animals and taking photos of them. 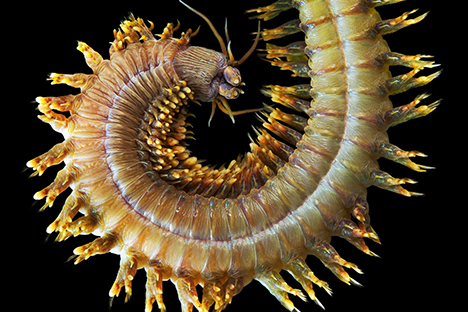 So, by now, we have documented all the nuances of the life cycles of many animals,” says Semenov. Everyone can take part in organizing the Aquatilis’ expedition around the world. A fundraising project for the initial, preparatory stage has been launched on the Boomstarter crowdfunding website. According to the biologist, such photos can be useful for students or researchers specializing in certain fields. “Underwater photos and videos add a lot of classical biology knowledge to modern research. For instance, if a researcher works on the taxonomy of a certain group, he or she is still interested in how the creatures live: Similar species could have totally different behavior patterns. We observe animals, compare our observations to the book, and realize that the book isn’t complete; a number of things can be added,” says Semenov. Another one of the project’s goals is to draw attention to the ecological problems of the world’s oceans. The route includes stops at “garbage islands”—giant accumulations of floating trash and dispersion plastic that are bigger than some small counties. Participants in the expedition want to film these islands and tell the world what happens to animals and the ocean in such conditions. The three-year-long expedition will be subdivided into 10 stages, each of which will last 2–4 months. Between eight and 16 crewmembers will be on board the yacht Aquatilis at any one time, depending on the specific stage’s mission. More than 50 people will take part in the expedition in total—whether at sea or on the ground—over the three years.